Marsel Backa and Long Tran made a deal to chop 1st and 2nd place money as they are friends. After a few hands of raising and re-raising, the two finally got it in. Marsel had said that he had looked at one card as he revealed his [Kc][Jh], and Long hadn't looked as he flipped over his first card, the [Ac]. His second card was the [9s], so he was in good shape to double up. Marsel said he'd win the pot for sure, and the [2d][9h][Ks] put his king jack in front. The [7d] turn changed nothing, and the [Tc] river meant Long Tran would exit the tournament in 2nd place, good for $65,191. 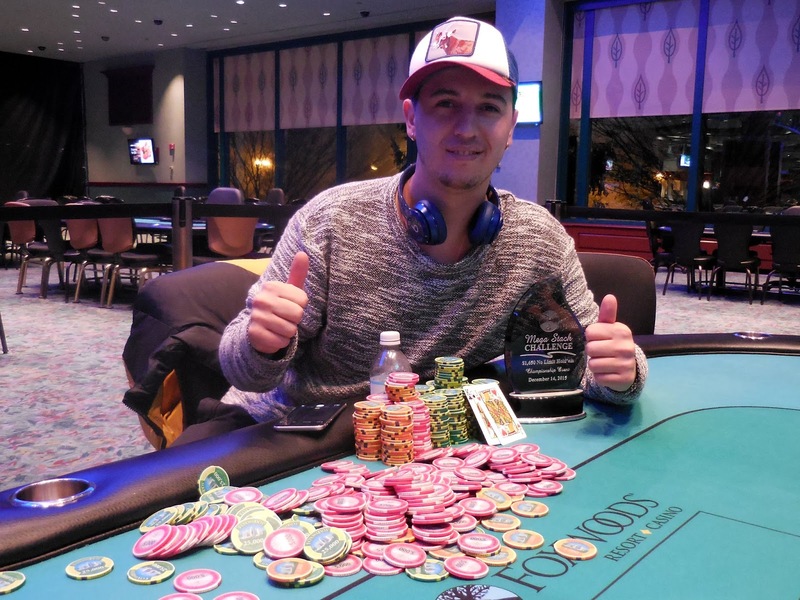 Marsel Backa has won the $1,650 Championship Event, taking home $65,191, the trophy, and the title. Congratulations, Marsel! Long Tran folded the button and Marsel Backa limped the small blind. Tou Kue moved all in from the big blind, and Marsel snap called. Marsel was 33% to eliminate his opponent, and the [2c][Td][Qh] flop meant Tou was in bad shape. Tou asked the dealer to give his opponent two pair, but instead the [Ac] hit the turn to give Tou top pair. Marsel asked for a king on the river, but instead the [Qs] fell, which was good enough to earn Marsel the KO. Tou will exit the tournament in 3rd place, collecting $32,554 for his efforts. 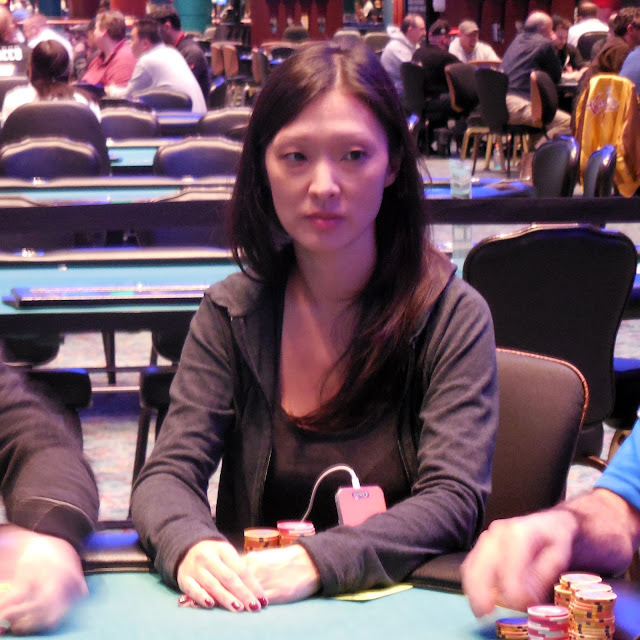 All three players saw a [Ah][9c][8c] flop, and Tou Kue raised after a bet and a call. Tou Kue folded but Marsel Backa made the call. The turn brought the [4h], and Marsel check-called a 220,000 bet from Tou. 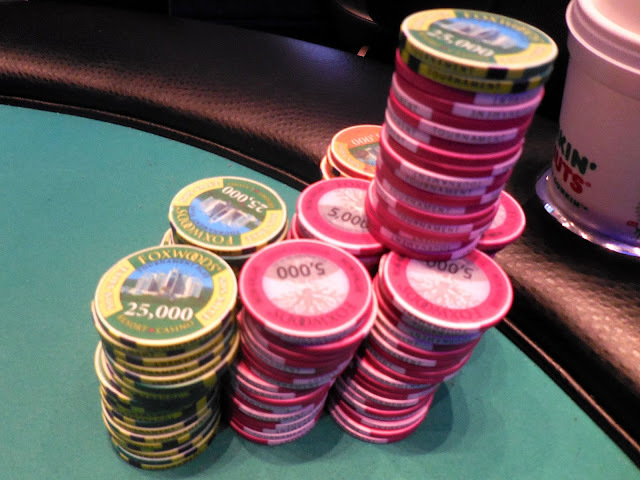 When the [Qd] hit the river, Marsel lead out for 700,000, almost all of Tou's stack. Tou went into the tank, but eventually called and saw the bad news. Marsel had rivered the nuts with [Jh][Td]. Tou mucked his hand, saying, "You got so lucky." 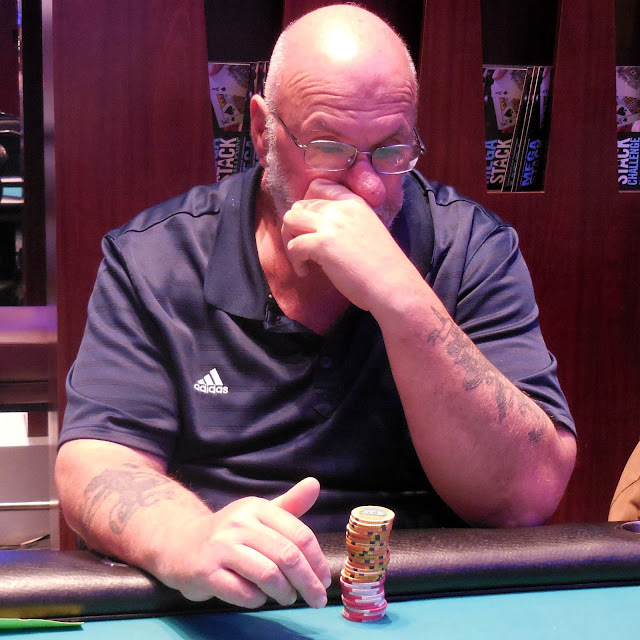 Ralph Macri was all in preflop [7h][7c] and was up against Marsel Backa's [Ks][Js]. The [Jc][6c][2c] gave Marsel top pair, but Ralph had set and flush outs. The [Kd] turn changed nothing, and the [Qs] river meant Ralph would exit this tournament in 4th place. Ralph will collect $26,306 for his efforts. Samantha Cohen was all in preflop holding [As][Jd] and was called by Long Tran holding [2s][2h]. The board ran out [3d][5d][6c][8s][Qh], and Samantha will finish this tournament in 5th place. She will collect $19,730 for her efforts. 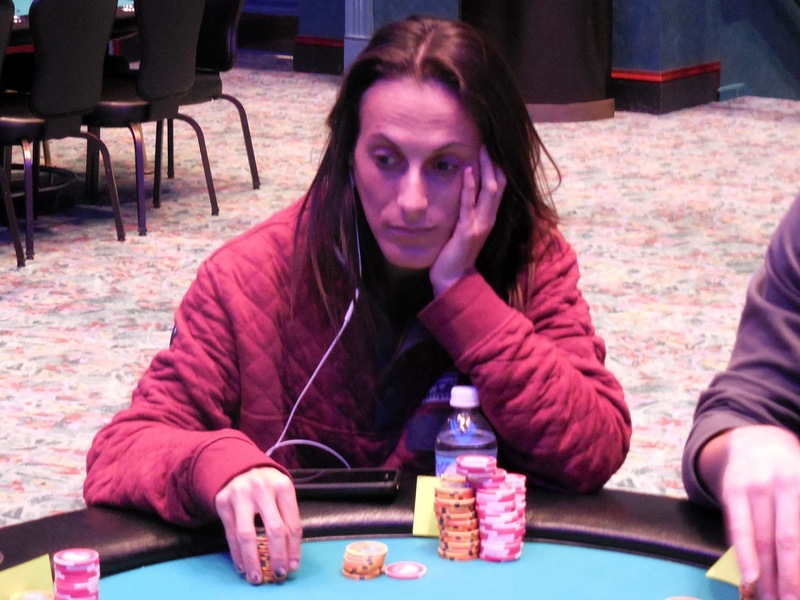 At 10,000/20,000 blinds with a 3,000 ante, Tou Kue opened the pot to 45,000 and Samantha Cohen made the call on the button. The blinds folded, and the two saw a [6d][2h][5s]. Things got interesting really fast, as Tou's 60,000 bet got raised to 160,000, and then Tou three-bet to 300,000. Samantha made the call, and the [9d] turn curiously brought a check from Tou. Samantha bet 350,000, only to be met with an all in by Tou. Samantha took her time before folding, and Tou took down a nice pot and now sits on almost 1,900,000. After the hand, Marsel Backa gave Tou props for the play, which he said he doesn't normally do. 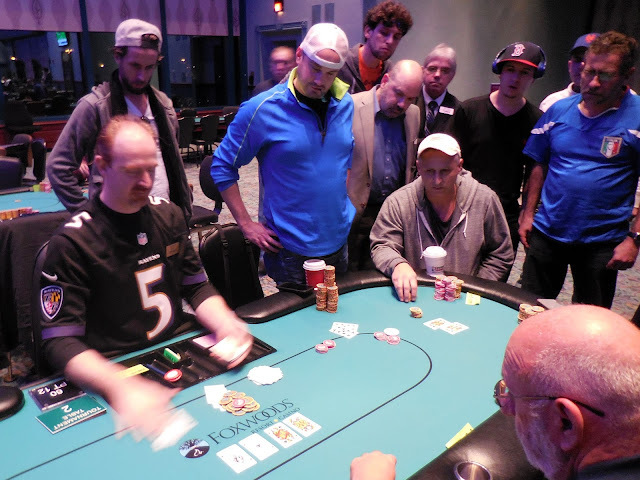 Jeffrey Yanchek opened the pot before being three-bet by Marsel Backa. 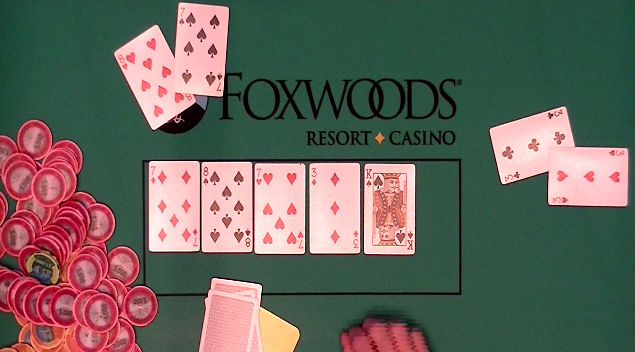 Jeffrey made the call, and then check-called the [Qh][4d][Qc] flop. The [9h] brought another check by Jeffrey, and Marsel bet 80,000. Jeffrey check-raised to 215,000, and Marsel smooth called to see the [8h] river. Jeffrey moved all in and Marsel snap called, and Jeffrey declared "straight" before seeing Marsel flip over [Qd][4s] for a flopped full house. 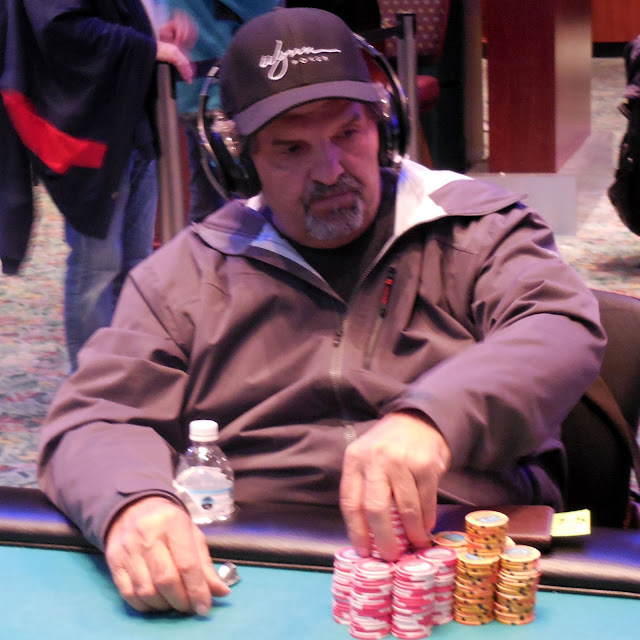 Jeffrey's jack-ten wouldn't be good enough, and he will be eliminated in 6th place, good for $15,784. Carlo Sciannameo was all in preflop holding [5s][5c] against Ralph Macri's [Ts][Td]. The [4s][Ks][3c] flop was no help for Carlo, but the [6d] turn gave him an open ended straight draw. The [8s] just barely missed, eliminating Carlo in 7th place. He will collect $12,824 for his efforts. Jeffrey Yanchek limped under the gun and Tim O'Keefe limped as well. Long Tran completed the small blind, and Ralph Macri checked. The foursome saw the flop fall [4s][Qc][6c], and Ralph bet 45,000 after being checked to. Jeffrey folded, and Tim raised to 110,000, leaving himself around 200,000 behind. Ralph moved all in after Long folded, and Tim made the call. Ralph had flopped two pair and would knock Tim out if he didn't get counterfitted. The [Kh] gave Tim three extra outs, but the [2d] river sealed his fate. 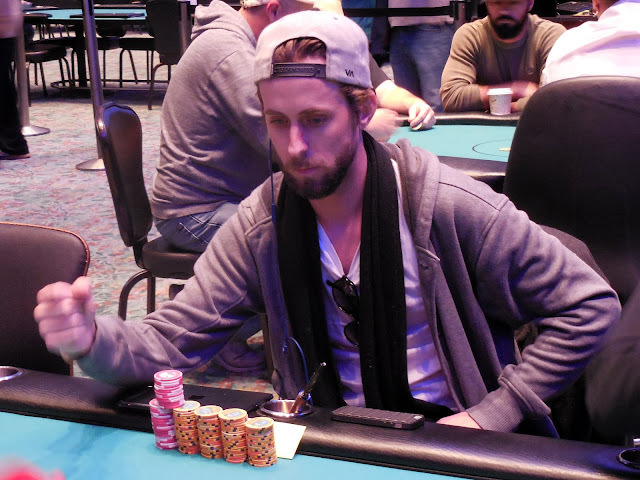 Tim will exit this tournament in 8th place, collecting $10,523. We arrived to find a board of [7d][8s][7h][3d][Ks]. 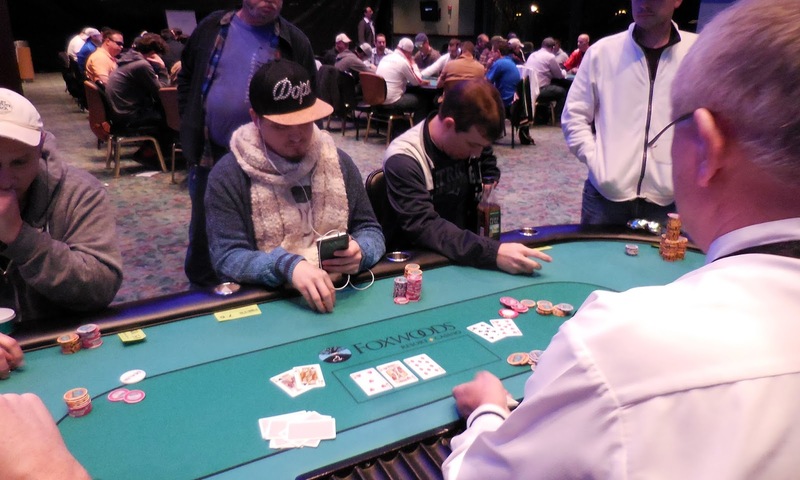 Marsel Backa was in the big blind and had moved all in, and Carlo Sciannameo, from under the gun, snap called. Marsel turned over [8h][7s] for a full house, prompting Carlo to jump out of his chair and say, "The one hand I can't beat" as he tabled his own full house with [3h][3c]. Luckily for Carlo, Marsel had lost a chunk of his stack in the last level to Samantha Cohen, so Carlo still has around 300,000. Meanwhile Marsel is back up to just over 1,000,000. 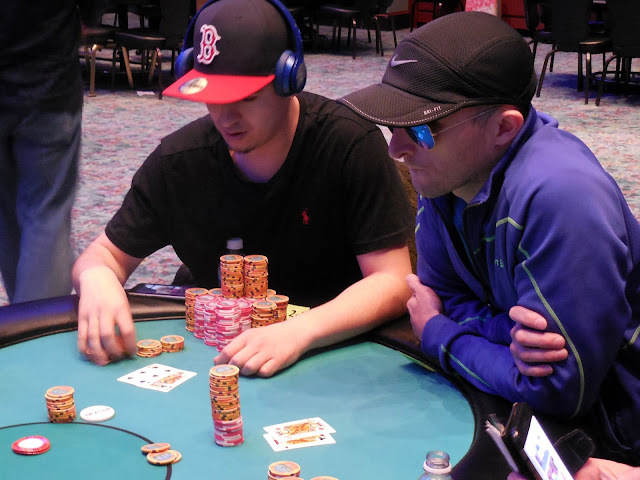 Tim Reilly was all in from early position and was called by Tou Kue. The rest of the table folded, and Tim got the bad news: his [Qc][Jc] ran into Tou's [Qs][Qh]. The [Js][8c][8h] flop gave Tim some hope, but those hopes were dashed on the [Qd] turn. The [7d] hit the river to send Tim to the rail in 9th place, good for $8,226. Levels will last 25 minutes. There will be a 45 minute dinner break after Level 14 (approximately 5:35pm). 10 players remain. Marsel Backa is the overnight chip leader. Levels be played for 60 minutes. A full series schedule is available here. From the button, Bryan Leskowitz was allin for 178,000. Long Tran folded the small blind, but Tim Reilly made the call from the big blind with pocket jacks. Bryan would need to get lucky with his ace four, but he did not improve. Bryan will take 11th place, collecting $5,754 for his efforts. The blinds have just gone up to 6,000/12,000 with a 2,000 ante. Day 2 will conclude at the end of this level, or when the final table of 10 is reached, whichever comes first. Only 11 players remain, so only one more player needs to fall for the final table to be set. At 5,000/10,000 blinds with a 1,000 ante, Marsel Backa raised to 24,000 before James Campbell moved all in for 220,000 on the button. Samantha Cohen flat called from the small blind, and Marsel made the call as well. With many eyebrows raised, the flop fell [Kh][8c][Jd]. Samantha checked and Marsel bet 100,000, putting Samantha in the tank. She eventually folded and Marsel said, "Good fold" as he showed [Js][Jh]. James was disappointed as he revealed his [Ah][Kd] for top pair, but he did have runner-runner outs. The [5s] turn was not one of them, and the [8h] river made Marsel the winning full house. 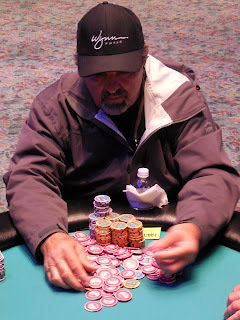 James will exit this tournament in 12th place, good for $5,754. After the hand, Marsel was up to just under 1,300,000. 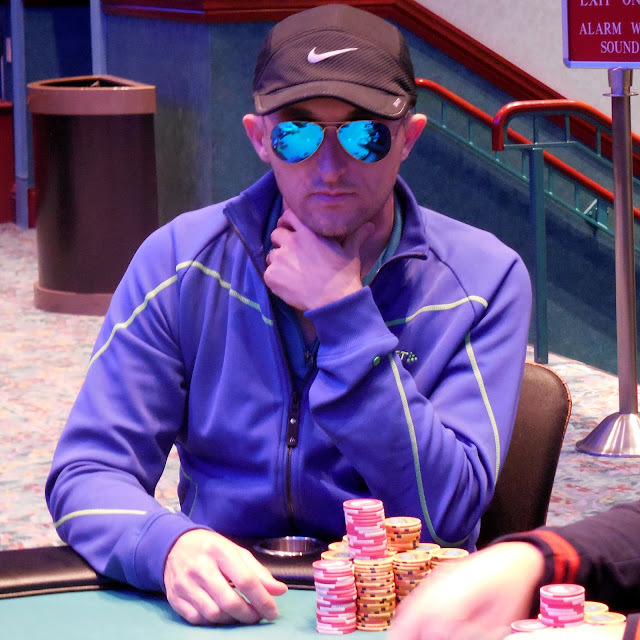 Jason Scudamore has been eliminated when his [Kh][Jd] failed to improve against Tim Reilly's pocket aces. 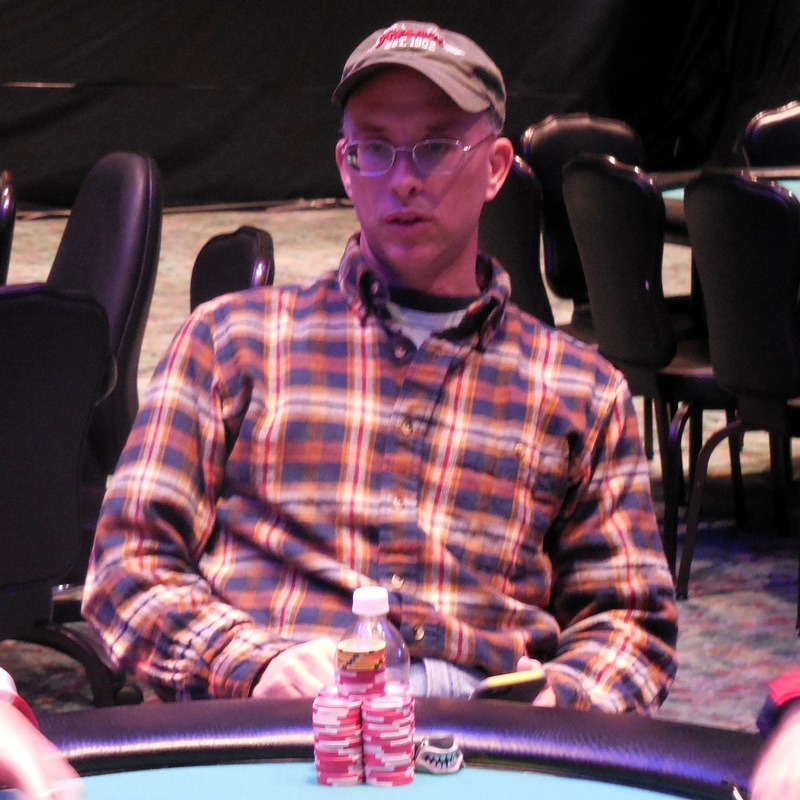 Jason will collect $5,096 for his 13th place finish. 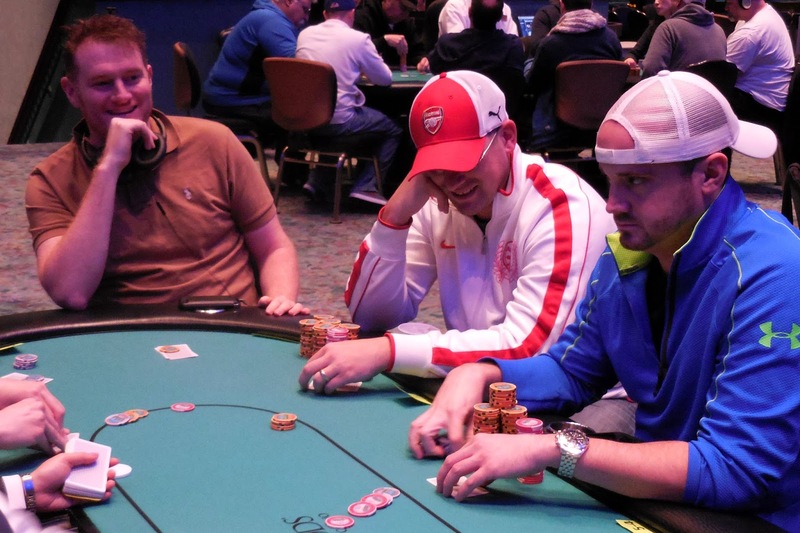 On a [Jc][9s][8s] flop, Mark Schumacher was all in. Carlo Sciannameo and Marsel Backa folded but Samantha Cohen called with [Qh][Qd]. Mark had a flush draw and a two pair draw with his [As][Js]. The [7d] turn changed nothing, and the [2c] river meant Mark would exit this tournament in 14th place. He will collect $5,096 for his efforts. 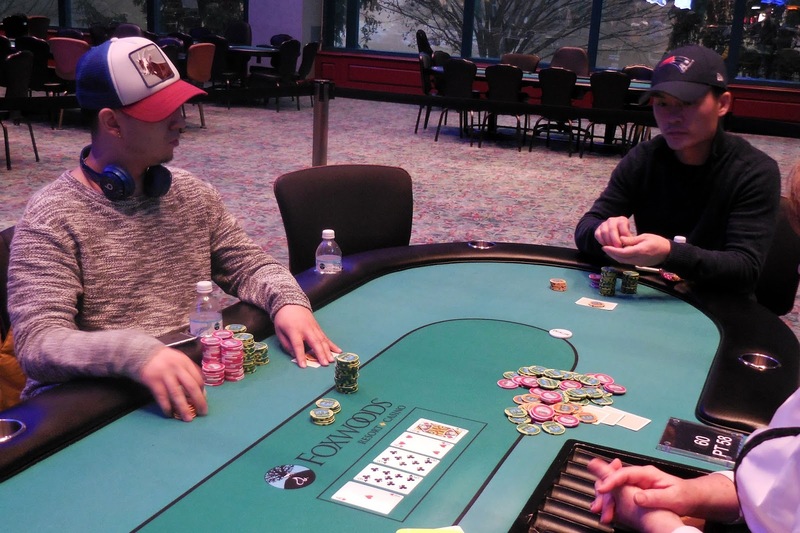 Long Tran opened the pot before Dan Chalifour moved all in. Long made the call and showed the best hand preflop, pocket aces. Dan sarcastically informed his opponent, "You're ahead," as he exposed his ace six. An ace hit the board to give Long top set, and Dan will have to settle for 15th place. He will collect $5,096 for his efforts. 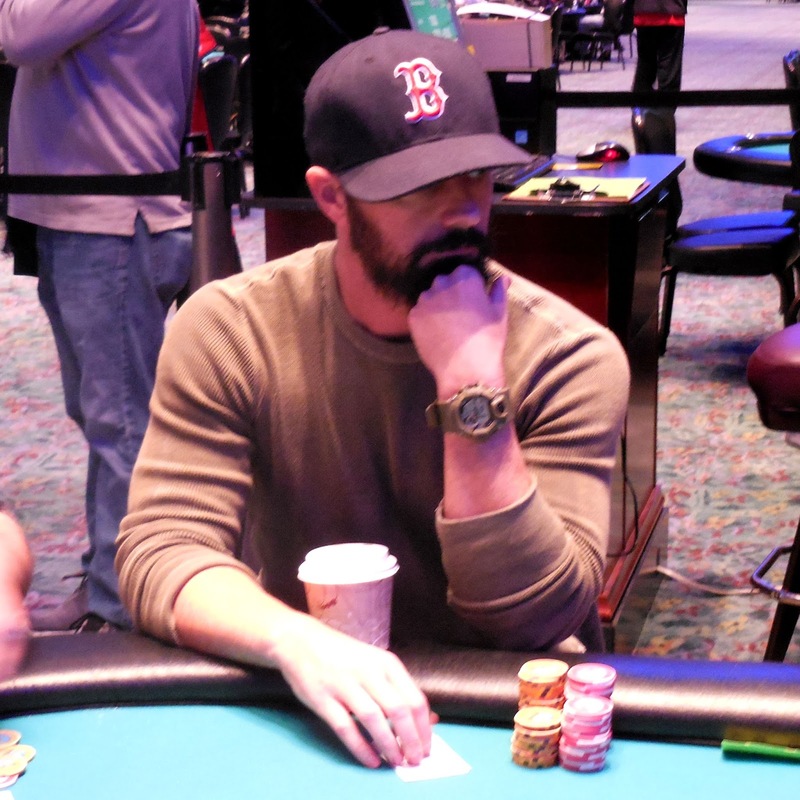 Jeffrey Miller was all in under the gun for 59,000 at 4,000/8,000 blinds and action folded around to James Campbell in the small blind. James made the call, and Samantha Cohen folded her big blind. It was a race as James held [5s][5d] to Jeffrey's [As][9d]. The the [2s][3c][Kd][8d][Qs] board meant James's fives would hold up, and Jeffrey will be our 16th place finisher. He will earn $4,439 for his efforts. Giuseppe Ruvolo was all in from early position and action folded to Samantha Cohen in the big blind, who made the call. It was bad timing for Giuseppe, who revealed [Kc][Tc] and would need to get lucky against Samantha's [Ks][Kh]. 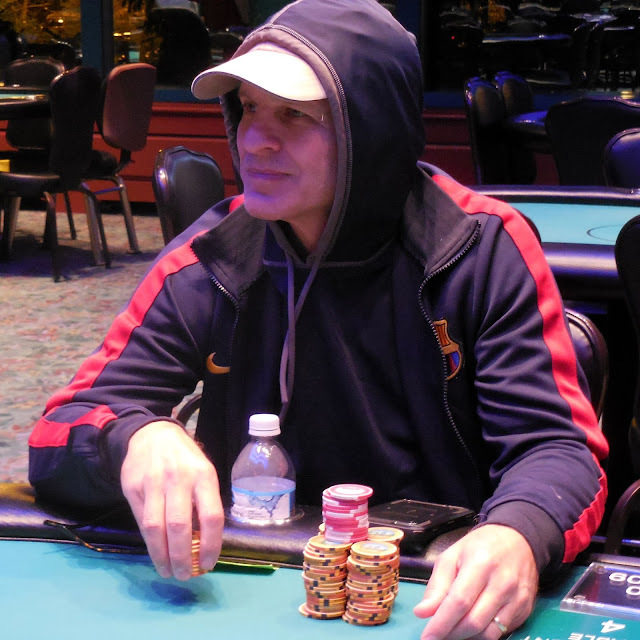 The [6c][Ad][9c] flop gave Giuseppe a live flush draw, and the [8s] turn added a gutshot to his outs. The [As] hit the river to give Samantha the winning to pair, sending Giuseppe to the rail in 17th place. He will collect $4,439 for his efforts. 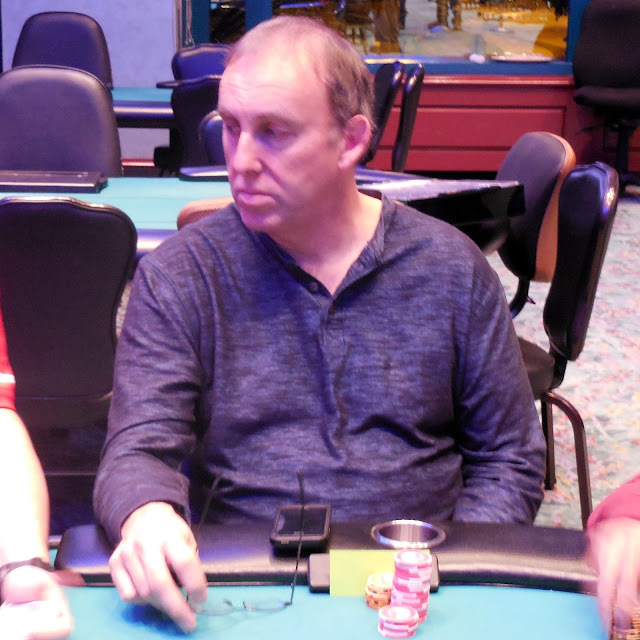 Randy Spain has been eliminated when he ran his pocket eights into Tim O'Keefe's pocket aces. 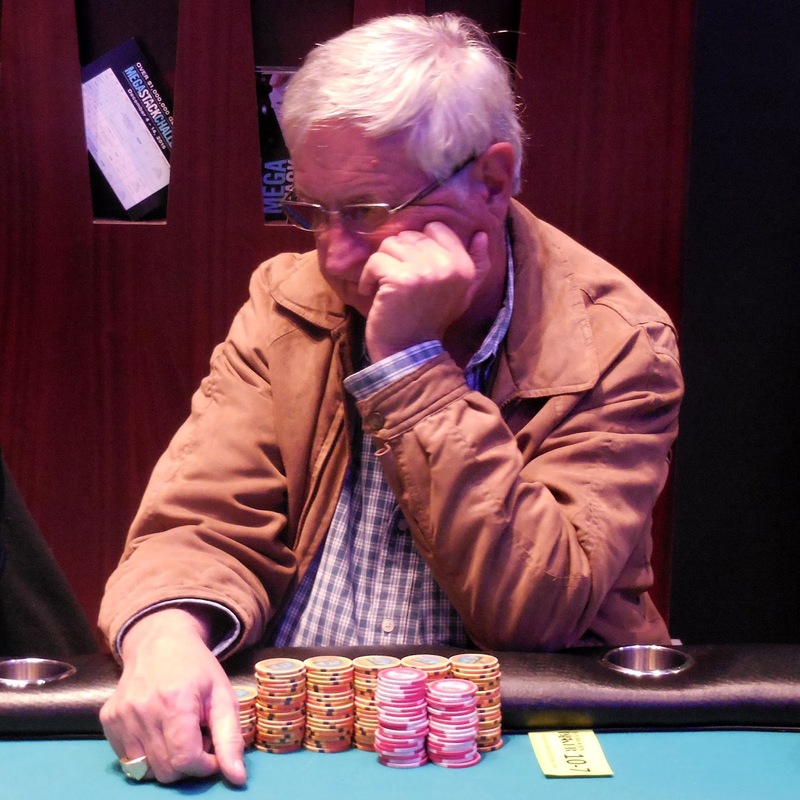 Randy will exit the tournament in 18th place, good for $4,768. 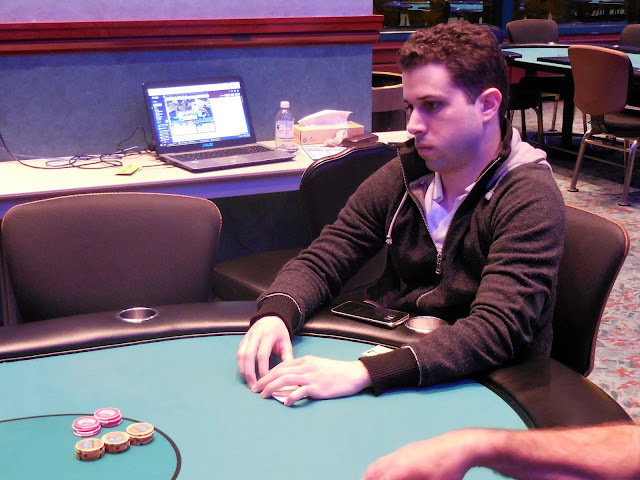 Joseph Berardi has been eliminated when his pocket eights fell to Ralph Macri's king jack. Joseph will earn $4,439 for his 21st place finish in this Championship Event. 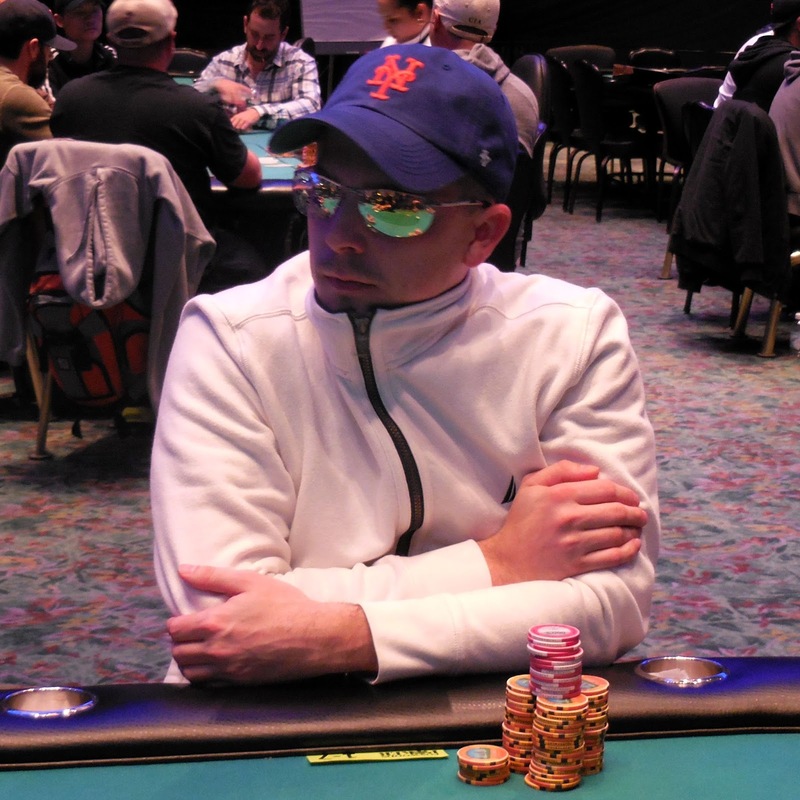 At 3,000/6,000 blinds with a 1,000 ante, Ralph Macri raised to 15,000 before Aaron Smith moved all in for 67,000. Action folded back to Ralph who thought for a bit before calling with [As][8s]. Aaron was live with [Kd][Td], and he flopped a flush draw when the flop fell [3d][7d][5h]. The [Ah] hit the turn, taking away six of Aaron's outs, and the [2s] river failed to complete his flush. 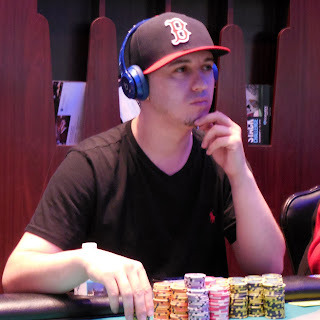 Aaron will exit this tournament in 22nd place, good for $4,110. A short stacked Julie Bae got the last of her chips in the middle with ace five and was called by a player holding ace king. The [9c][Jh][Js] flop gave Julie some hope for a chop, and the [8h] turn gave her some more outs. But the [Ts] river kept ace king in front, and Julie will exit this tournament in 22nd place. She will collect $4,110 for her efforts. David Anderson has been eliminated when his ace nine was outrun by Marsel Backa's queen ten. The board ran out [Td][4d][5c][Jc][9s] to produce the first in-the-money casualty. David will earn $4,110 for his efforts. At 3,000/6,000 blinds with a 1,000 ante, Kevin Calenzo opened the pot and Ralph Macri reraised him. Action folded back to Kevin who moved all in, and Ralph snap called. Kevin had run his pocket nines into Ralph's pocket kings, and was at risk of being the bubble boy. The Q-Q-A flop was no help for Kevin, but the ace on the turn gave Kevin two extra outs to chop. The river bricked, and Kevin will be the bubble boy. The remaining 24 players are now in they money and guaranteed $4,110. Suad Kantarevic doubles up again! In almost the exact same history as earlier, action folded to Marsel Backa on the button who moved all in. Suad Kantarevic called all in, and David Anderson folded the big blind. This time, Suad woke up with [As][Ac], much to the chagrin of Marsel who held [Ad][Ts]. The [5s][8s][5c] flop only gave Marsel backdoor outs, and the [Kd] left him drawing dead. The [6s] river saw Marsel ship over 166,000 Suad's way, and once again hand-for-hand play will continue. 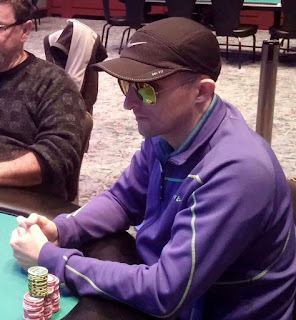 From the button, Marsel Backa moved all in, having the blinds covered. 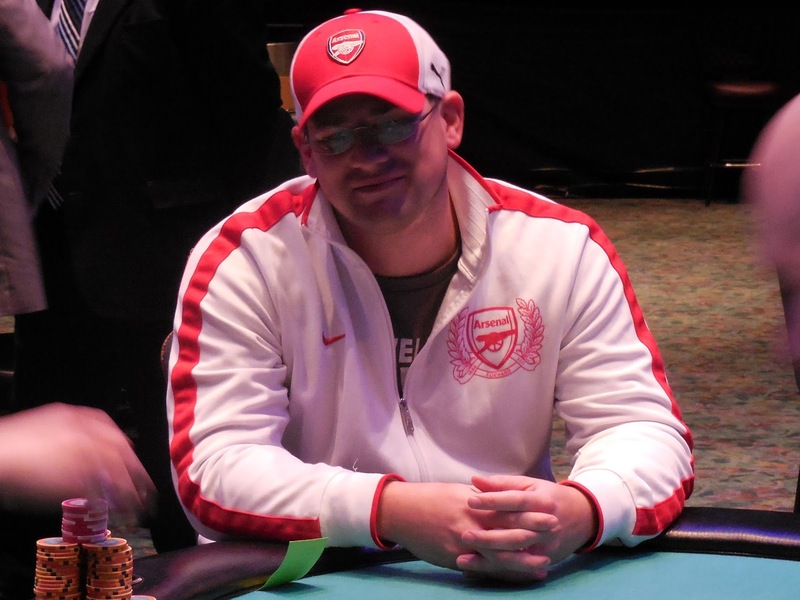 Suad Kantarevic called all in for around 80,000 and David Anderson folded the big blind. Suad had the best of it with [Jd][Jc] against Marsel's [Kc][6s], and the [Tc][5h][3h][7h][Ad] board kept the jacks in front. Suad will double up to around 170,000, and the tournament will continue hand-for-hand play. 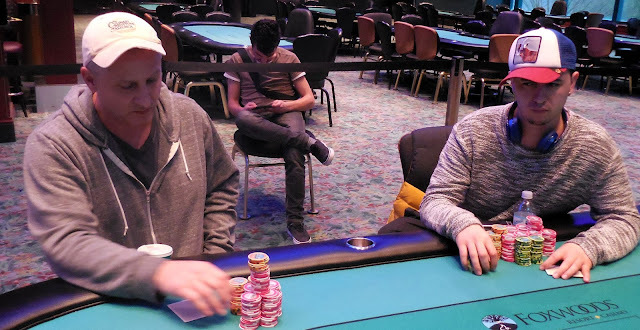 The final 25 players in the $1,650 Championship Event have returned from their one hour dinner break. Hand-for-hand play will continue, and the blinds are now 3,000/6,000 with a 1,000 ante. 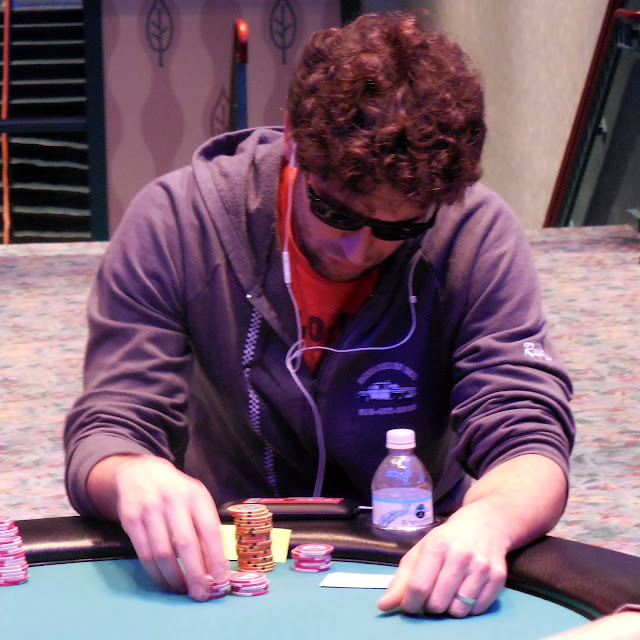 Chris Tryba was eliminated in 27th place and Michael Borchetta was eliminated in 26th place. With 25 players remaining, the tournament is now hand for hand. The next player to be eliminated will be the bubble boy. The remaining 24 players will make the money, guaranteeing them a minimum cash of $4,110. Here are full seating assignments for the final 27 players. We will get chip counts in 15 minutes when the players go on dinner break. A player has been eliminated in 28th place, bringing the field down to the final 3 tables. The remaining 27 players are now redrawing for seats, and play will resume shortly at 2,500/5,000 blinds with a 500 ante. In one single orbit, Ralph Macri has knocked out three players at the feature table. First, Mike Clemente was all in holding king queen on a king high board against Ralph's ace king. Ralph's kicker held up, and Mike was sent to the rail. A few hands later, Ralph called a raise from Chris Tryba before Alex Rocha moved all in. Chris folded, but Ralph made the call with ace jack. Alex had him beat with ace king, but joked that Ralph had three jacks to hit. Ralph proceeded to his one of the jacks and send Alex packing. Dominik Pelli was next to feel Ralph's wrath, running his pocket tens into Ralph's pocket jacks. With 30 players remaining, Ralph now sits on around 490,000. Giuseppe Ruvolo moved all in from the small blind and Andy Frankenberger called from the big blind. It was a flip as Giuseppe held [as][kd] to Andy's [th][tc]. The board ran out [Kh][ac][3s][3d][9s] to give Giuseppe a double up to 120,000, leaving Andy with just 13,000. Andy looked for a spot to get the rest of his chips in, but folded for an entire order. Finally, he was in the big blind for 5,000 and had 1,000 behind. Under the gun limped and Kevin Calenzo made it 16,000. Everyone folded to Andy who joked about folding before throwing his last 1,000 chip. 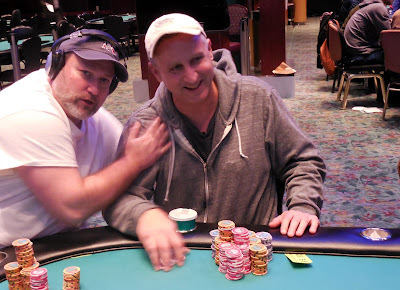 UTG got out of the way, and Andy had one live card with his [Th][9h] against Kevin's [9s][9c]. After the [8s][3h][Qs] flop fell, Kevin jokingly told the dealer to ship the pot to Andy, implying he'd hit his six outer for sure. The [Qc] turn and [2h] river missed Andy's draw, however, and he was eliminated one table away from making the money. 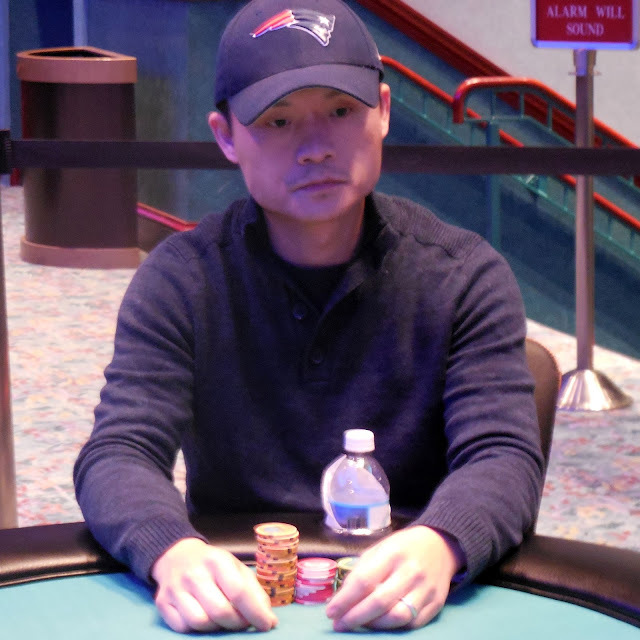 Long Tran opened the pot preflop and Carlo Sciannameo made the call. The flop fell [4d][8d][5s] and Long c-bet, only to be raised from Carlo. Long made the call and the turn fell [Th]. Long checked, and Carlo bet 70,000, only to be met by an all in by Long. Carlo snap called, turning over [7d][6c], and had Long's [Qh][Qd] drawing dead. The meaningless [Jc] hit the river to earn Carlo a full double up and make him the first player over a half a million in chips. After taking a few hands to stack up his winnings, he now sits on 623,000. 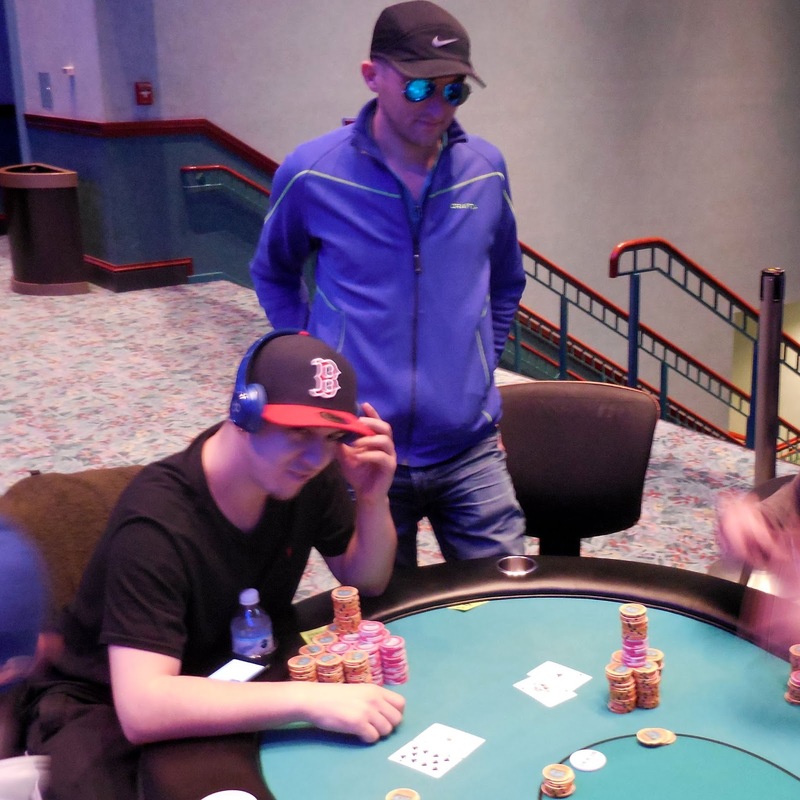 At 2,000/4,000 blinds with a 500 ante, Ralph Macri opened to 10,000 from the button and Fred Paradis moved all in for just under 50,000 from the big blind. Ralph made the call, and it would be a coin flip with Ralph's [Ks][Jc] against Fred's [9h][9c]. Ralph hit the [5h][Kh][Td] flop, and Fred could not find a nine on the [7d] turn or [8c] river. He will be eliminated short of the money. When Day 2 started, Marsel Backa had only 55,400, good for 55th place out of the remaining 84 players. 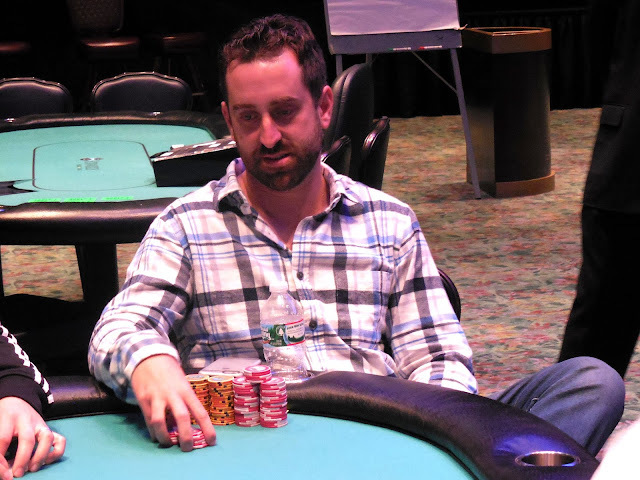 But in the first two levels, Marsel has managed to work his stack up to 270,000 and now sits in the top 5 in chips. 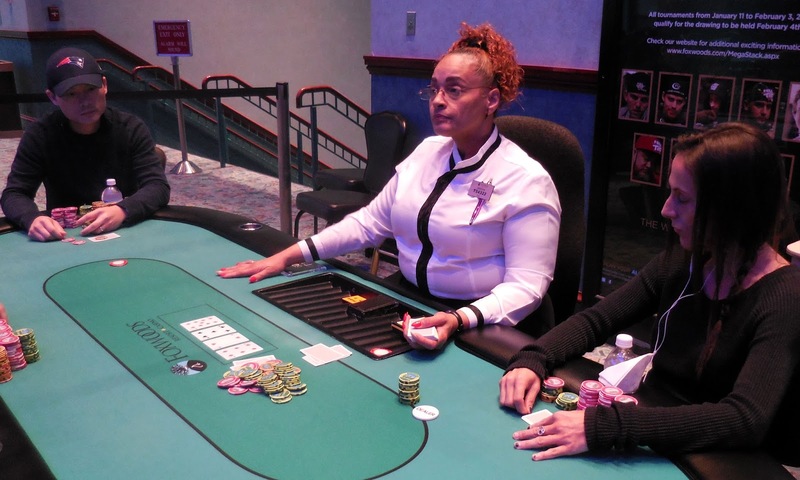 Samantha Cohen opened preflop and Alex Rocha made the call as did Luis Alves in the big blind. All three checked the [5h][As][6d] flop, and Alex bet 8,000 after being checked to on the [Ks] turn. Luis folded, but Samantha made the call. The [7d] brought a third check from Samantha, this time prompting a 13,000 bet from Alex. Samantha took her time, but eventually made the call, only to see Alex show down [Ah][7h] for two pair. Samantha mucked, claiming ace queen to Alex's disbelief. After the hand, Alex was up to 142,300. There are currently 61 players remaining in Day 2 of the Championship Event, and those players are now on their first 15 minute break of the day. When players return, blinds will be 1,200/2,400 with a 400 ante. 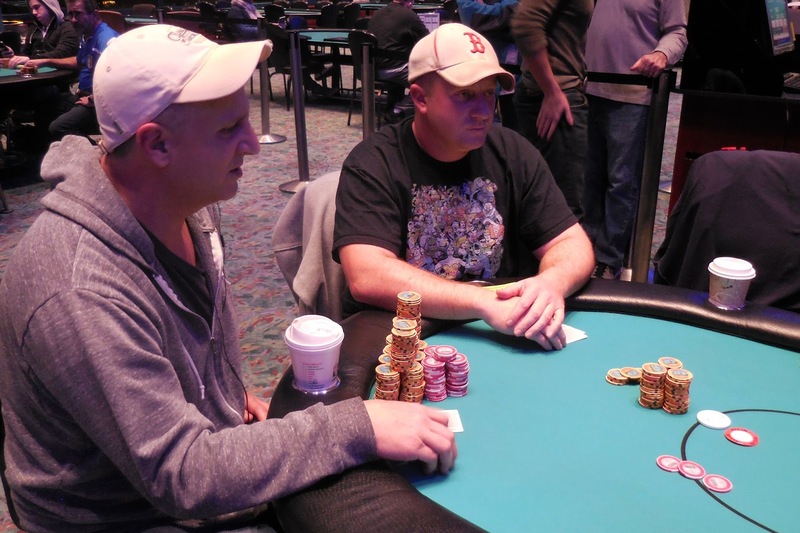 As Level 14 comes to a close, 63 players remain from the 84 that returned to Day 2. Let's check in with the chip leaders from the top of the day. 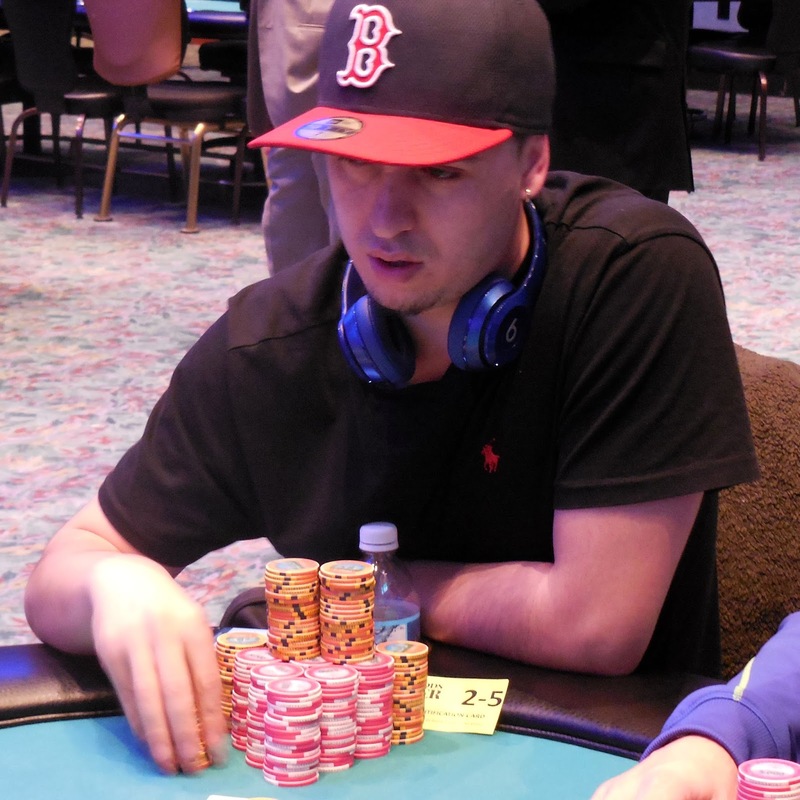 Suad Kantarevic started the day as the tournament chip leader with 243,000, but has dropped to 171,000. 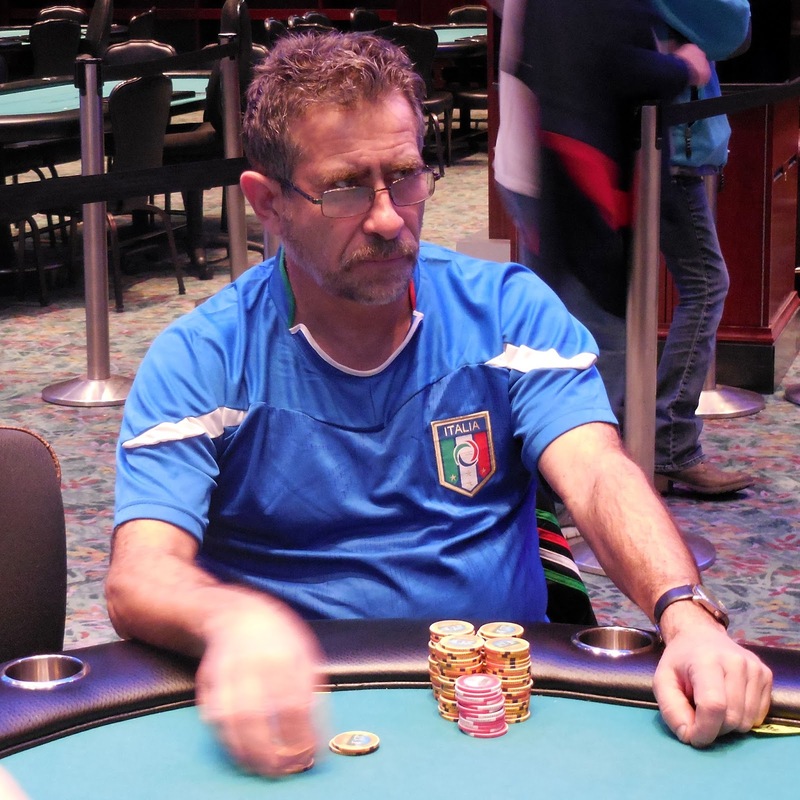 Meanwhile, Carlo Sciannameo started the day with 220,200 and has increased his stack to 335,000. Robert Campion and Dave Stefanski started the day in 4th and 6th place, respectively, but have both dropped to well under 100,000. Robert has 51,000 while Dave has 75,000, still plenty of room to maneuver as the blinds are 1,000/2,000 with a 300 ante for 8 more minutes. Giuseppe Ruvolo and Tou Kue started the day in 3rd and 5th place and haven't made much movement. Cards are in the air for Day 2 of the Championship Event. Currently 84 players remain, and the top 24 players will make the money. You can watch a live stream of our feature table at www.FoxwoodsLive.com. Levels will last 20 minutes. There will be a 45 minute dinner break after Level 20 (approximately 6:25pm). Day 2 will conclude after Level 22 (approximately 11:30pm) or Final Table, whichever comes first. The clock was paused with 10 minutes remaining, and a card was drawn. Three more hands will be played before the survivors from Flight B will bag up for the night. They will combine with the remaining players from Flight A at 12pm to play Day 2. The board currently reads 26 players remaining. Suad Kantarevic limped in early position and Steven Tabb also limped. The next player raised and there were two calls before Steven moved all in. After a long time in the tank, the original raiser folded and Suad called. Steven was in bad shape with pocket sevens against Suad's pocket tens, and he couldn't hit a seven to survive. He will bust out as the last level of the night begins. Players in Flight B of the Championship Event are now on their last break of the night. Registration will close when this break concludes, and we will have prize pool and payout information shortly thereafter.